Home / 80's / Shout! 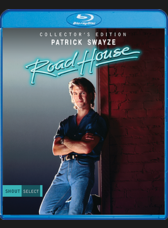 Factory Announces Special Features for Road House blu-ray!!! Shout! Factory Announces Special Features for Road House blu-ray!!! A month or so ago Shout Factory announced a new line of blu-rays called Shout Selects. This line would be for films that don't fit into the Scream Factory while giving the films their own brand. Films like both Bill & Ted films, Buckaroo Banzai, and Road House were announced for this line. - What Would Dalton Do? Street date is September 6th and retails for $29.93 but can be found for cheaper than that.